alias Cloyd Campfire & Rawclyde! “You’re going to Hawaii,” said the sergeant. “I thought I was going to Kentucky,” said the private. “They changed your orders,” said the sergeant. Pvt. 1 Donald Duty gulped and darted out of the sergeant’s office. Hawaii is over commercialized, thought Duty, too expensive and atilt with tourists. I’d rather go to Kentucky, where nobody else goes. There on the weekends I could get lost in the tranquil woods. And a negative attitude was born within the flabbergasted private as he darted out of the sergeant’s office. Duty would not leave the barracks on his first weekend stationed at Tripler Army Medical Center on the island of Oahu. He would not leave the barracks on the following weekend either. Consequently his negative attitude grew worse. Then one Saturday evening, as the sun was setting and the wind was growing fierce, the unhappy private was languidly staring out his Company A barracks room window, which was wide open, when he heard a distant drumming. The drumming became louder, closer. Soon enough, Duty could hear heavy footsteps outside, and the breaking of twigs, and the murmur of voices. Duty peered out the window a little harder. He saw a column of men marching across the summit of a nearby hill. It was an unusual bunch of fellows, for they were wearing strange feathered helmets on their heads and strange feathered capes on their shoulders. They were also carrying fiery torches, and spears that gleamed in the moonlight. The most peculiar thing about them, though, was their bare feet were not touching the ground as they marched! They were the Marchers of the Night ~ the ghosts of Hawaiian warriors from yesteryear out visiting an old battle ground. One of them turned his head and grinned at the astounded private. The ghosts were marching along loudly chanting, when booming thunder suddenly drowned out their voices. Lightning cracked the sky and they were gone. Duty was left trembling and speechless. Rolling black clouds, silhouetted in the moonlight, became wispy and gentle, churned about, and gradually formed into a beautiful woman hula dancing in the sky! Duty’s eyes bulged out like two full moons. Then she turned into a red Hibiscus flower. Duty reached out, picked up the flower. He smelled its sweet fragrance. 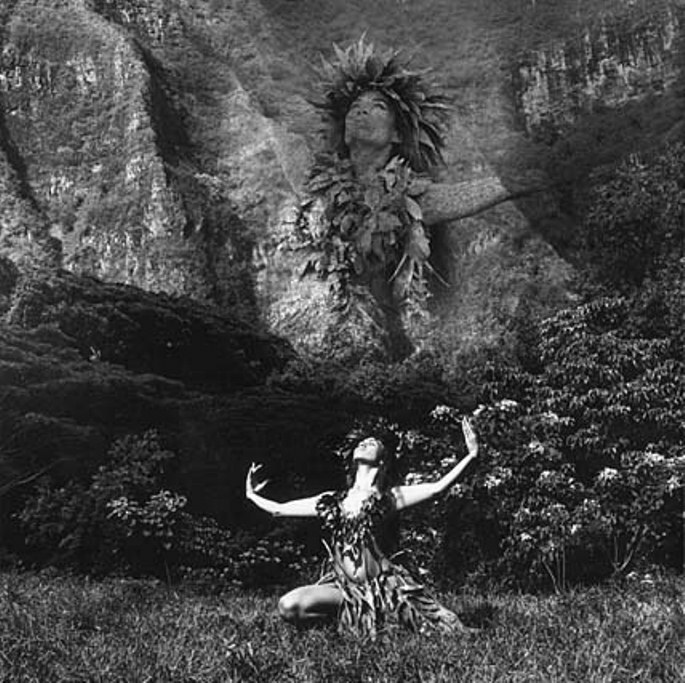 Laka, the hula goddess, had just welcomed him to Hawaii! On the following day, Sunday, Duty took a 50 cent ride on the mass transit bus (route 52) around the entire island of Oahu. Coming down out of the pass on the other side of the mountains, the private was greeted with the enchanting spectacle of Kaneohe Bay. The bus rumbled onward beside miles and miles of crystaline beaches and turned down a long wide valley between two mountain ranges. The private wondered about many fields of funny looking little plants ~ for he thought pineapples grew on trees. And later, while standing in the cool surf of Waikiki with a red Hibiscus flower behind his ear, and surrounded by many races of people, he realized that the skyscrapers of Honolulu towered up into a sky that did not know air pollution. Pvt. 1 Donald Duty’s negative attitude was nevermore. This entry was posted in love peace and freedom and tagged Hawaii, soldier, USA. Bookmark the permalink.